Faculty, staff and students at the University of Miami now can utilize the full suite of Adobe Creative Cloud software at no cost. The institution is the first in Florida to be designated an Adobe Creative Campus, signaling its commitment to connecting learners to digital tools and expanding digital media literacy across disciplines. "The university aims to always provide its community with the most cutting-edge tools and technology, at little to no cost, to align with its mission to transform lives through teaching, research and service," according to a news release. 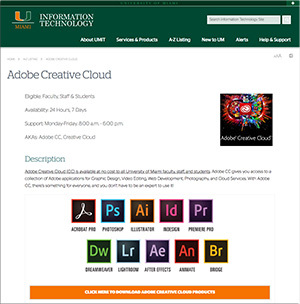 The Adobe Creative Cloud, which includes Photoshop, Illustrator, Premiere, InDesign, Acrobat Pro and other tools for graphic design, video and photo editing and web development, will join a portfolio of other applications available for free to the University of Miami community, such as the Microsoft Office Suite, McAfee VirusScan and Box. "Adobe is so useful for all students, whether it is to learn for personal use or a career skill. It helps students branch out and learn more useful tools," said University of Miami senior Aaron Gluck, who also serves as IT student government liaison and a software licensing employee in the university IT department. "UM Student Government and UMIT have worked really hard to make this happen, and we hope that a lot of students will download the software and take advantage of the incredible opportunity we've been given." "Adobe and the University of Miami are each committed to supporting students with technologies that will enhance their academic experience and help differentiate them in their careers," commented Jonathan Hammond, Adobe vice president for North American education, in a statement. "Adobe Creative Cloud empowers students to communicate in digitally and visually compelling ways, resulting in students that are more engaged in their classwork. Learning outcomes are improved and critical thinking and creative problem-solving skills are fostered — all skills necessary to succeed in this digital economy."